Powers/Abilities: The Black Toad was armed with a blowgun that shot poisonous darts. He was always accompanied by Charlie, Rocco and other thugs who were all armed with submachine guns. 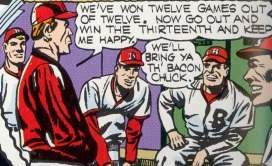 History: (Captain America Comics#7/2 (fb) - BTS) - Chuck McArthur, manager of the baseball team the Brooklyn Badgers, leads the team to the best record in the league. (Captain America Comics#7/2) - Chuck went to the Badgers' owner Bernard Riggley, and asked to buy a part of the team. Riggley refused, and Chuck muttered threats as he walked away. Chuck planed to ruin the team, which would force Riggley to sell them to him cheap. That night Chuck disguised himself as the Black Toad and hid under the baseball field's grandstand during the Badgers game against the Blue Sox. The Toad used his blowgun to kill Adams and Diraggio, two of the Badgers star players. Captain America and Bucky were present at the game, and ferreted out the Black Toad. The Toad's henchmen knocked the heroes out, allowing the Toad to escape. The next day Captain America and Bucky replaced two of the Badgers at a night game. This drew the Black Toad's attention, and he tried unsuccessfully to kill Cap with a baseball rigged with a bomb. The Toad then killed Riggley, and his thugs ambushed Cap and Bucky. After a brief battle the Black Toad fled to the grandstand's roof. Cap easily beat him and unmasked him. After explaining his dastardly plot, the Black Toad leapt off the roof to his death, unwilling to face justice. Comments: Created by Joe Simon & Jack Kirby. The date of Spring, 1941 is defined by George Olshevsky in the Marvel Comics Index Series. The Brooklyn Badgers and the Blue Sox are Marvel analogs of the Brooklyn Dodgers and the Boston Red Sox. 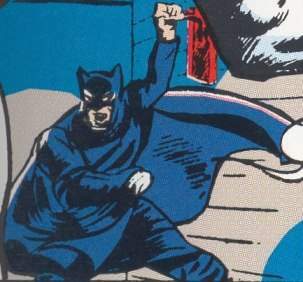 Black Toad's costume resembled the DC character Batman much more than a toad. Toads don't have ears, do they? Rob "Spirit of '76" Flick informs us that "In the Lee-Kirby fill-in issue, Captain America#112, from 1968 or so (in-between Steranko issues, I believe), the infamous Black Toad is shown in flashback as one of Captain America's early villains. In the one-panel scene, however, he is given the name, Toadman, for whatever reason...perhaps so as not to confuse him with other Toads that were hopping around Marvel comics at the time. Black Toad/ Toad/ Toadman sure had an identity crisis! Another point I want to make concerns his oft-mentioned resemblance to Batman. If you pull out the original story again, and look at each instance where the Toad is referred to by name, you will obviously see that the name was changed after the story had been pencilled and lettered. In each case, the name "Toad" is written by another letterer and squeezed into a space that had been taken up by only three letters. It becomes apparent that the villain was intended to be called the "Bat", thus making even more of a connection to the baseball theme. or any other characters named "Black" or "Toad". Adams, Bill Rickey, Diraggio, Myers, Chuck McArthur manager, others unnamed. They went on a twelve game unbeaten streak until the Black Toad killed Adams and Diraggio in their unlucky thirteenth game. Captain America and Bucky substituted for Bill Rickey and Myers as pitcher and catcher in their next game.